I've would probably pass the Grade Book to the Calculator rather than the Calculator to the GradeBook. Is there a reason for doing it that way? Yes, that would work, too. Just comes down to the raw details of what sort of system you are building. What is your “rule of thumb” for too many lines in a class? A method? 20, 50, 100? I'd say most of my class files have less than 100 lines of code, and methods less than 20. There are always exceptions, though. Brilliant article Scott. This is the best quote which i can keep remembering: "However, improving at software development is an endurance race, not a sprint. There is no substitute for writing code in anger and doing so over a long period of time. If you care about your work, you’ll naturally learn a little bit every day, and every little bit you learn will help you form your own opinions and heuristics on how to build software." Thanks for keeping us Motivated Scott. Thank you so much Scott. This is such a well written article about a pretty complex (and highly opinionated topic). I think this is a great rule of thumb: > If you write a sentence saying you can use the class to ___ and ___ in a system, then it might be time to look at making two classes instead of one. @Lev: I haven't. I'll put it on the todo list. @Scott, How do see SOLID principle in discussion? Another great article, Scott. They're always so cleanly written, keep up the good work! If only I could get some of my current team to understand the benefits of smaller chunks of logic (and TDD, for that matter). On getting to the "optimal" method length, I am not sure about everyone else, but I usually just get a high-level method done and working first, even if it ends up as say... 200 lines of code. Afterward, I'll go back and refactor them out and make my highest level code human readable and keep refactoring things out from the higher level methods until I arrive at the smaller lowest level methods. Once I am happy that I can understand the thing and I can be positive that when I come back to the code in 6 months later I can still understand what it's doing by just reading the highest level method and the subsequent children, I stop. Most of the time, I will get my methods broken down into relatively small chunks this way. @Abishek: The S in SOLID is single responsibility principle. Like I say the post, if you just focus on the S in SOLID you'll go a long way. OCP, ISP, and DIP (the O, I, and D in SOLID) all flow out of the S, to me. Great article! Have you ever thought about creating a course where you would share your wisdom similar to that in this article? I think it would be really awesome. @Jan: Yes. The hardest part (other than making the course itself), is to get Pluralsight to accept my course ideas. Nice article. Is the idea behind the following sentence that you will be angry because the code your are working on is in such a poor state? "There is no substitute for writing code in anger and doing so over a long period of time." I apologize for a poor choice of words. "coding in anger" is a saying I've heard over the years and means I'm coding to really, really, really get something done, so there is a lot of focus and determination. I noticed you stated a good place to split classes might be anywhere you can say a class does _____ AND _____ . Yet, the correct GradeBook class is responsible for "storing and retrieving individual grades". While I agree that this should be handled by one class, I'm wondering if you can provide some insight into how to distinguish between and AND that indicates a nice splitting point vs an AND that can sort of be implicitly ignored when looking at dividing classes. I've been having a dialogue in my head about why this might be the case, but I have a feeling this is something that you learn to intuit over time. Any thoughts? Thanks in advance for your reply! Great question. There are some apps where I'd consider storage a single responsibility, particularly in simple scenarios where create, read, update, and delete are all straightforward. Then there are the applications where it makes sense to separate reads from writes. 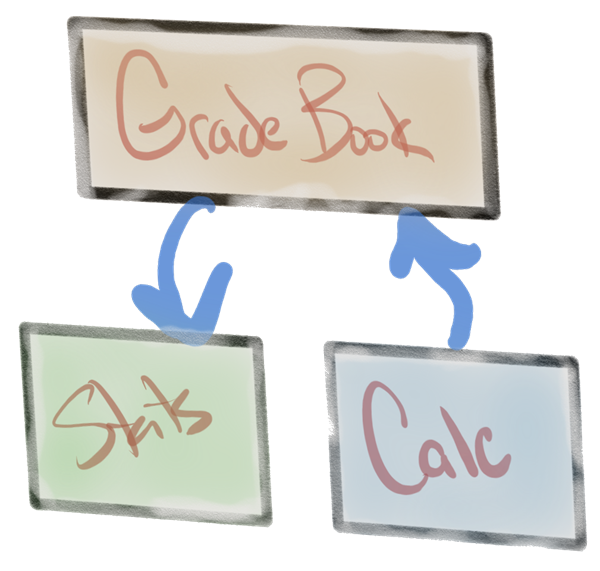 So a class to save, update, and delete grades and another class to query grades. It is a judgement call, but the code to support queries (with paging, filtering, and sorting) is very different from code to support updates (with validation, authorization, and more business rules in general). That's the essence of the CQRS design pattern, and it can make complex scenarios easier. Hope that makes some sense.